On Thursday morning, 2:30 a.m. we arrived at Omisalj, where we spent the night in a hotel (the only place on the island, where we found a 24 hours reception via www ). The next morning we met with the others from Vienna at a nice herping place in the center of the island. Within "a few minutes" we found a large Elaphe quatuorlineata female (Bero, look at the dull coloration), a Pseudopus apodus and a Hierophis carbonarius, last one unfortunately with blue eyes. Here I finished my walk for this morning. The others went further and found a Vipera ammodytes female, 2 Zamenis longissimus - one grey with bright yellow scales (hope to show some pics here later) - and an Elaphe quatuorlineata male. In the afternoon we splitted into two groups. While we went to the south of the island the second group drove to the north, to the place, where the Natrix tessellata has been found. As expected, they found none ). But also we havn't been successful, only a few Lacerta trilineata have been heared, running into the bushes. During the night from Thursday to Friday the weather changed. In the morning it was completely cloudy with some rain drops and wind. Anyway, we tried our luck, but only with little success: 2 adult Hierophis gemonensis and one baby by one group and one gemonensis and some trilineatas by the other (no pictures by me). During late afternoon, I showed the others a ditch. This "secret place" is one with the most dense populations of Emys orbicularis on the island. Saturday morning: Weather nearly the same like the day before. But with some sunny periods between. We all together went to another place in the center of the island. The other group a Vipera ammodytes female in a stone wall and 2 Testudo hermanni females. Sunday morning we did a short stop in the north of the island before starting our way back home. Only a few lizards (Algyroides nigropunctatus and Podarcis melisellensis) and a subadult Anguis fragilis. And here 2 Podarcis siculus from the 1st day with red belly and throat. On Krk island, red-bellies are restricted to the more forested interior of the island. Looks like you had some good days although the weather was not so merciful! Interesting to see those orange-bellied siculus specimens - the first one would probably look like waglerianus in ventral view. There are (vague) plans for a Krk trip from our Belgian crew in 2016, so I'll sure pay more attention. Aaargghh, how easy is it for most people to find quatuorlineata! After so many trips to the Balkans I still have to see an adult... Great findings and fantastic colouration on the Zamenis! Bobby Bok wrote: Aaargghh, how easy is it for most people to find quatuorlineata! After so many trips to the Balkans I still have to see an adult... Great findings and fantastic colouration on the Zamenis! Even with my rheumatism I stumble on them , if not my friends/colleagues are much faster on the way. just a pathological lier (which I don't believe),... it's not "of course not", why should it be? BTW, if you may wish an expert opinion on your orchids, just tell me, I have a real expert at my disposition. I mean, just to check the species, the photos as such (an sich) are great, no question about that. 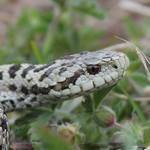 Very nice findings, obviously this time of the year is much better/perfect for herping.